St. Peters. Sydney Park serving as the backdrop to a jaw dropping City skyline. An industrial history that formed a suburb now known for its unique charm in Sydney’s own backyard. Both historical and modern it is forever unique. All of this and more on your doorstep so what’s holding you back? If the answer is pain or discomfort in your back or neck than you need to get in touch with Sydney Wide Chiropractic and organise a treatment today. A cohesive and strong body requires balance, and we are dedicated to restoring that balance to you when pains and discomforts are affecting your quality of life. We design industry leading treatment programs and practices that will restore your body’s vitality and provide ongoing benefits as we educate and rehabilitate you to self-heal going forward. We avoid a dependence on drugs or surgery and offer a service that utilises your very own body to encourage balance and improve the functionality of your nervous system through safe and effective treatment modals. 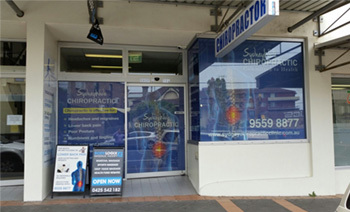 Our qualified and skilled staff are pioneers in the field and truly understand that a healthy and functional nervous system and stable spinal pillar don’t require endless and expensive chiropractic care but instead come from supportive and informative treatments that help remove the stress from your life and encourage ongoing self-healing and self-regulation. No more back pain, an end to neck stress, as the premium chiropractor in St. Peters, we guarantee results that will benefit you in the short and long term. Regular chiropractic care can make the difference between a body that is functioning with a painful imbalance and one that is aligned and at the peak of wellness. As the leading chiropractor in St. Peters we are more than simply handling your back and neck pain, we’re also here to provide a full body approach to wellness that will leave you wondering how you ever lived without it. So if you’re ready to make a change that will increase your standard of living than give us a call on (02) 9559 8877 or email us at info@sydneychiropracticclinic.com.au and make an appointment today.